Important note: Use the walkie talkie! When arriving at Schroeder Creek Resort use the portable radio (Walkie Talkie) to call the Director. The Radio is in a wooden box on the side of the outhouse (biffy) in the north section of the parking lot, just above the beach on Bickel Road). Make sure to turn off the radio and put it back after you use it. Kootenay Lake is in southern BC, about 8-10 hours from Vancouver, Seattle, or Calgary and about 4 hours from Spokane. It’s best not to arrive late in the day, or be ready to stay one night in the vicinity before crossing the lake to set up camp. THERE IS NO ROAD! 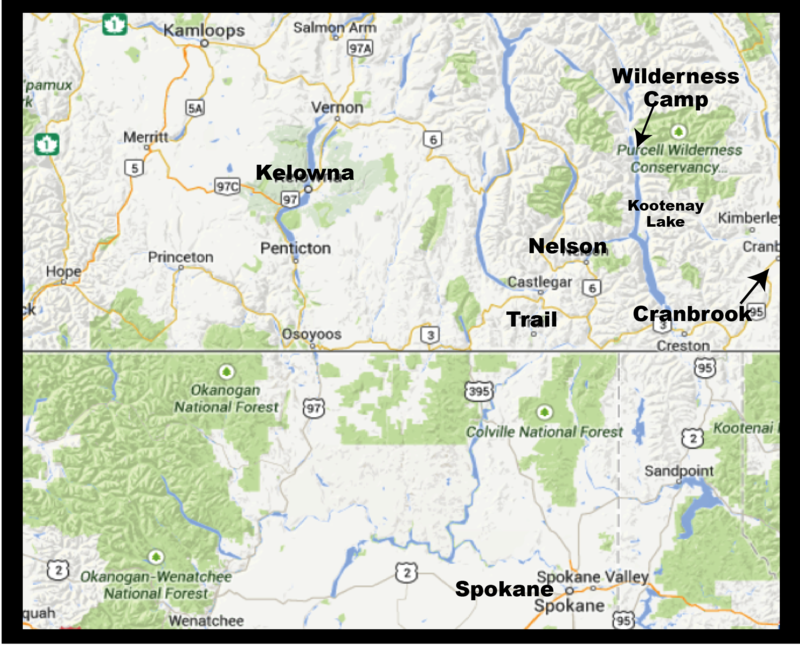 The best access to Kootenay Lake is on Highway 3 through southern BC until you reach Nelson or Creston. From Spokane, the best route north is up Highway 2, 20 and 31 to cross the border at Metalline Falls. One you reach the area you need to go up the west side of Kootenay Lake on Highway 31 to the town of Kaslo, the last stop for all supplies. 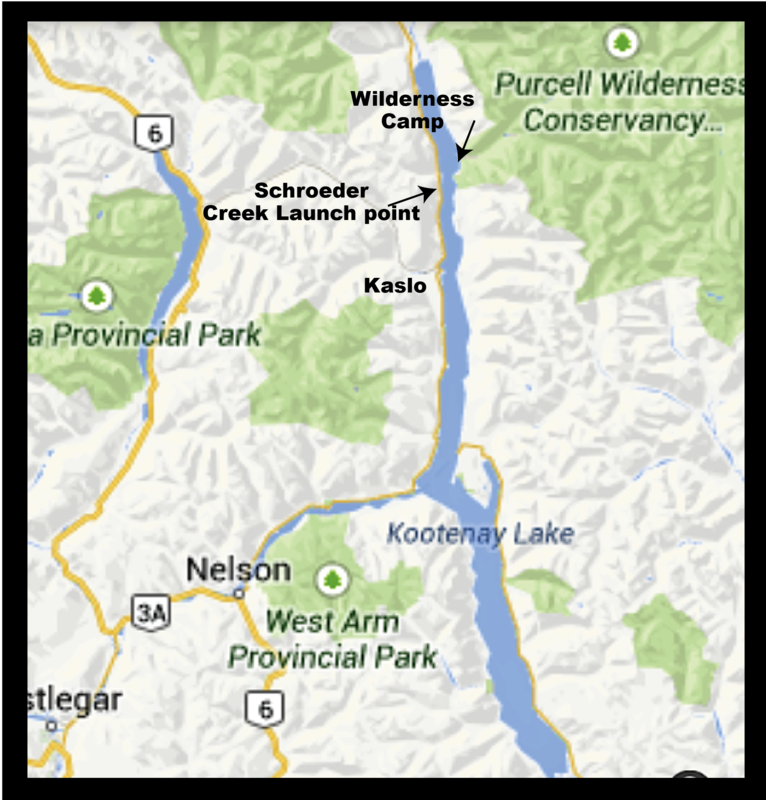 Continue through Kaslo, up Highway 31, about 15 km (10 miles) to the small resort of Schroeder Creek, where you park your vehicle and radio the camp director to come to bring you across in the ample camp boat. The radio is in a brown covered box on the side of the outhouse on the north side of the road and parking lot. 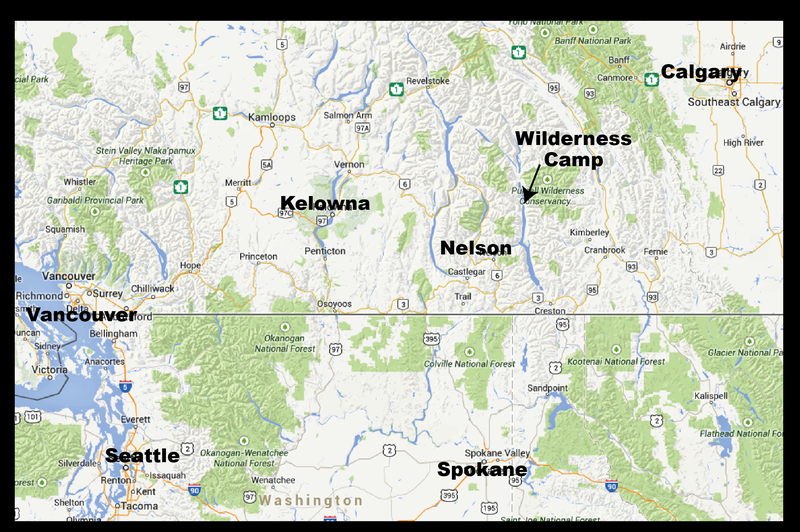 Plan to arrive in mid-afternoon so that you can get to camp and set up in the daylight. An overnight stop at an en route point within 100 miles / 160km of camp will allow you time to shop and arrive at the landing as suggested. If you arrive too late, or if the lake is choppy into the evening, you will need to find alternative accommodation for the night. Campsites are available at Schroeder Creek Resort. 1. 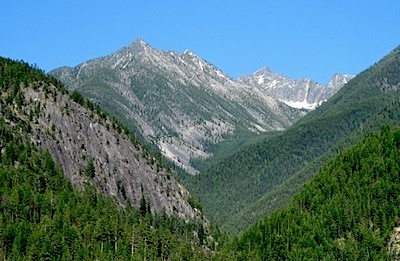 Head 15km north of Kaslo to Schroeder Creek Resort. Turn in to Bickel Road and drive to the end of the road at the beach. 2. Use the Camp Walkie to call the Camp Director between 8 am and 8 pm. The Walkie Talkie radio is in a lidded brown wooden box on the side of the little grey outhouse just a little north of the road, and in the parking lot. Instructions are also in the box or attached to the radio. The Camp Director or Boat operator will let you know when to expect the boat. In good weather it is usually very quickly or within the hour. The boat will not run if winds or waves are high or conditions are unsafe. Turn it on to use and please TURN IT OFF when you’re done. 2. Hold down the button on the side to call WILDERNESS CAMP. CALLING CAMP. 3. After you finish talking about arrangements, number in group and pickup. TURN IT OFF! and put it back in the box. It should come up automatically to Channel 9 the one we always use. 3. Tell the camp director that you have arrived and how many are in your party. The camp director will let you know when to expect the boat. 4. It is suggested that you do not unload your gear until the camp director has confirmed that the boat can come to pick you up. 5. Be careful not to drive your vehicle onto the beach at the end of Bickel Rd.—the sand can be very soft, and it’s easy to get stuck. Unload your gear onto the beach. The boat will pull in here. 6. Parking – park your car along the north side of Bickel Rd. at the beach end. If you cannot find space, the boat operator may be able to suggest something. 7. You will need to sign a waiver form that the camp director will provide, before you can get into the boat. You may not need to fill one in if you have a previous waiver form on file. Sign the Waiver Everyone going in the Camp Boat MUST sign a waiver. Parents must sign a release for their children as well. The Camp Director will have waivers in the boat, but you can download the PDF, print and sign in advance if you like. NWWS 2018 Adult Waiver Form. and NWWS 2018 Indemnification Children.